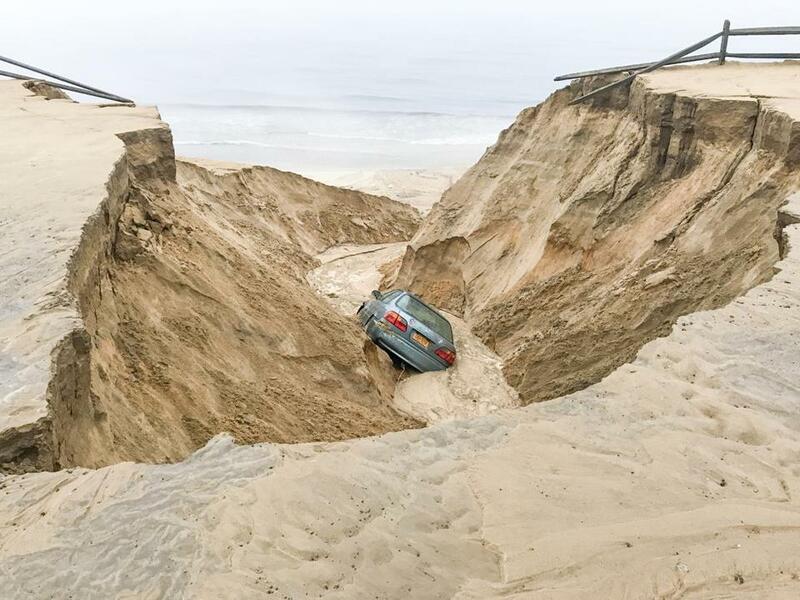 In Wellfleet, which received between 6 and 7 inches of rain, the weather caused a car to fall into a sinkhole as the beach eroded away. Heavy rain fell on Cape Cod and the Islands early Saturday morning, leaving the region with a “significant flash flood event,” the National Weather Service said. Many towns received 6 or 7 inches of rain, with Eastham getting the most at 8 inches, meterologist Lenore Correia said. “Eight inches usually surpasses the monthly total” for August on Cape Cod, she said. In Wellfleet, which received between 6 and 7 inches of rain, the weather caused a car to fall into a sinkhole as the beach eroded away, Correia said. The National Weather Service issued a flash flood warning for Barnstable County between 12:30 and 2:30 a.m., which was when most of the rain fell, she said. That amount of rain falling on the Cape in one night is unusual, something that happens only “once every couple of years,” she said. “We had a low-pressure system moving by, so it just clipped the Cape,” resulting in the heavy rain, she said. Other parts of the state received around a quarter-inch of rain at most, she said. Boston hit 74 degrees in the early evening, the highest it had been all day, with a sea breeze blowing, said meteorologist Glenn Field. But if the breeze dissipated, the wind could shift from the east to the south, and the temperature could climb into the 80s before or just after sunset, he said. “There’s an ever so slight chance” of a shower between midnight and daybreak Sunday morning, he said. Temperatures in Boston were expected to soar into the high 80s Sunday and Monday, and could reach 90 on Tuesday, Field said. No rain was forecast until Tuesday evening and Wednesday, when there is chance of showers and thunderstorms, he said.